Choose your course to get started. This Iowa Life, Accident & Health pre-licensing course follows the state examination content outline, and includes a supplemental Iowa law booklet covering the state's insurance laws and agent regulations. What topics are covered? What insurance can I sell? What insurance can I sell? Major Medical / PPACA (Obamacare) - PPO, HMO, EPO, POS, etc. This Iowa Life insurance pre-licensing course follows the state examination content outline, and includes a supplemental Iowa law booklet covering the state's insurance laws and agent regulations. 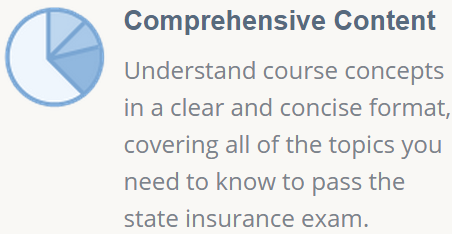 This Iowa Accident & Health pre-licensing course follows the state examination content outline, and includes a supplemental Iowa law booklet covering the state's insurance laws and agent regulations. 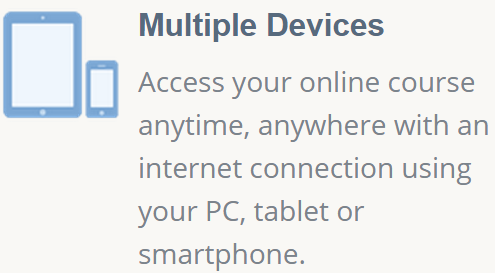 What's included in your course? 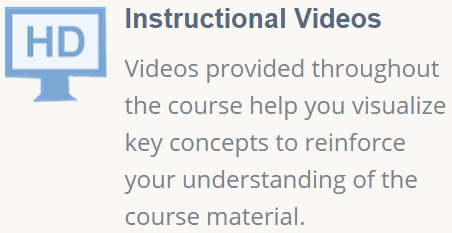 Learn more about the features included in your course. 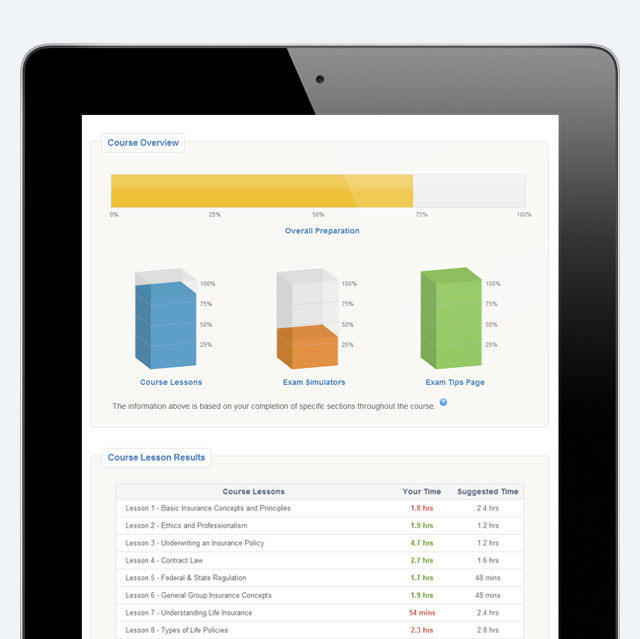 Like a personal instructor, Pass Report guides you through your by recording the amount of time spent in each lesson and displaying your progress. Pass Report also lists all lesson exams, final exams and exam simulator scores, providing you with an overall view of your preparation so that you know when to schedule your state exam. We provide you with a visual representation of your overall course completion so that you can gauge your readiness for taking the state exam. 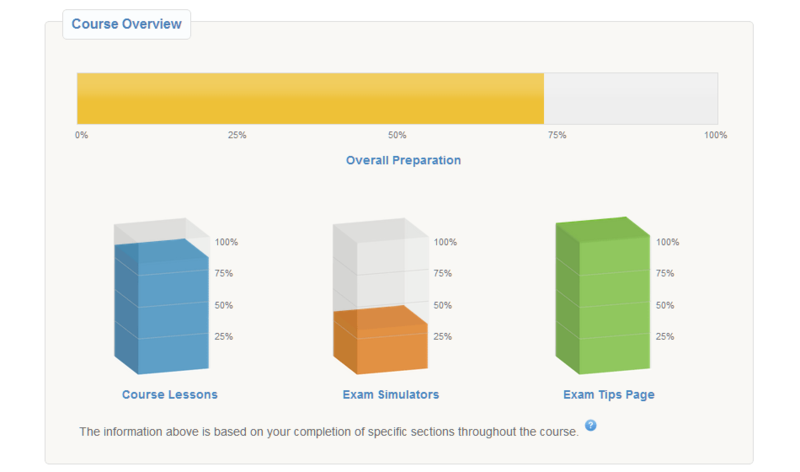 Lesson completion times, recent exam scores, and state exam tips are displayed in a bar graph format for quick reference of your course progress. 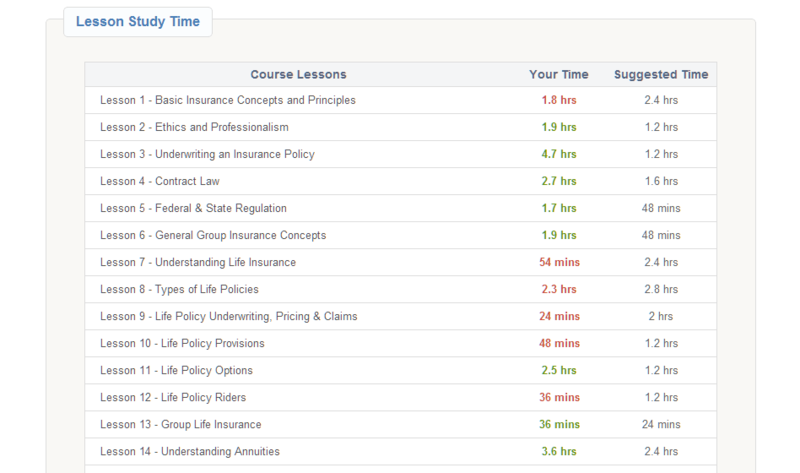 We monitor the amount of time you spend studying and compare it with the amount of study time we suggest for each lesson, based on its importance on the state insurance license exam. 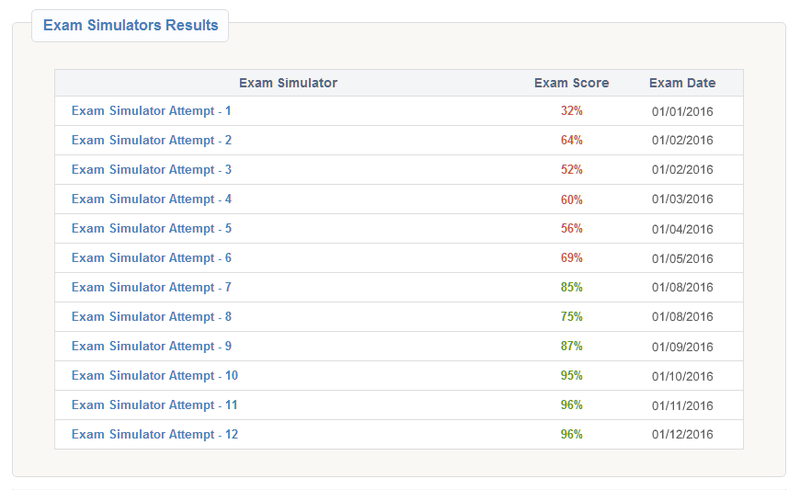 We track your exam scores and list them to show your progress. Although it is not a shortcut for being prepared, practice exams help determine your retention of what you are learning. Get the attention you deserve. Our licensed and state-certified instructors are ready to assist in your insurance training and can help guide you through the licensing process. 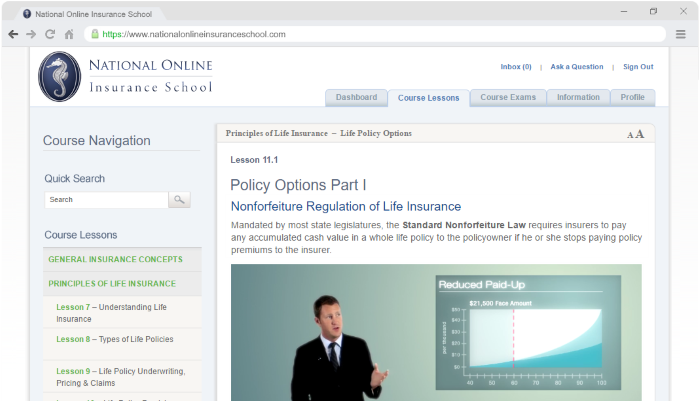 In comparison to a classroom, our online instructors are available 7 days a week during your entire enrollment period with National Online Insurance School. We have trained thousands of students across the country. 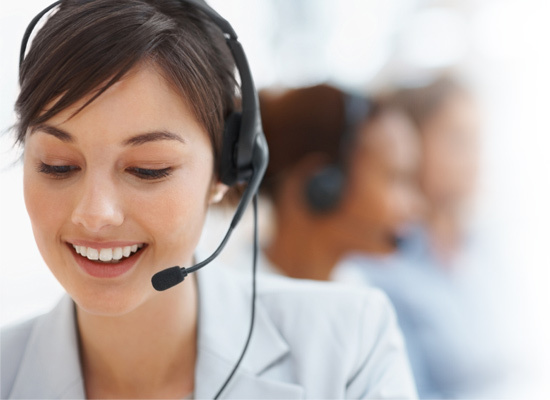 "National Online Insurance School's website is very well organized and user friendly. My was easy to access and understand. I would recommend this to anyone interested in obtaining their life insurance license." "Your exam prep was easy to follow and the support you gave when I had a question was quick... thanks for helping me pass!" "I had a great job lined up coming into this course, and I didn't want to let my future employers down. 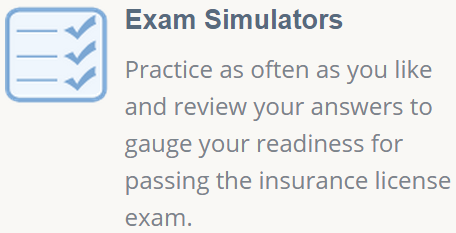 With that on my mind, I needed to be sure that I chose the right to help me pass the health insurance exam. This exceeded all expectations." "I thought getting back into insurance was going to be difficult. Thank you for making the first steps of this process easy!" 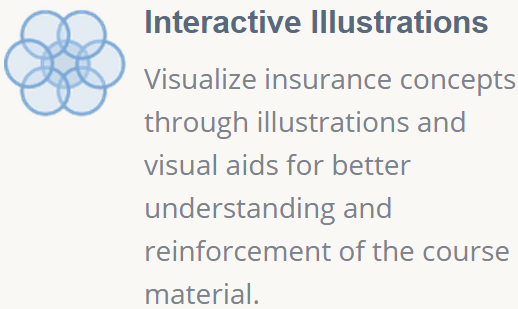 Do your courses cover everything I need to know for the Iowa state insurance exam? Yes. 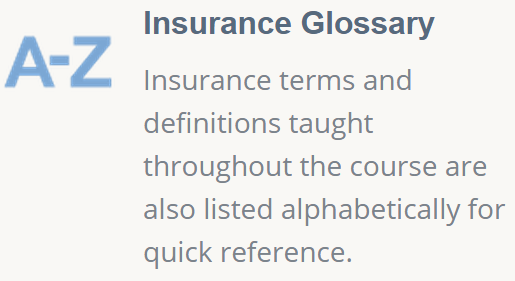 Our courses teach all of the topics that you'll need to understand to pass your state insurance exam, including the Iowa insurance laws and regulations. What are the licensing requirements to obtain my Iowa insurance license? To guide you through the pre-licensing process and obtain your Iowa insurance license, please visit our How to get an Iowa Insurance License page. Connect with us on our social networks & get more tips from our insurance blog!